A FREE Prequel Novella to DON'T TURN AROUND! Download to your eReader today. Includes sneak preview chapters of DON'T TURN AROUND. 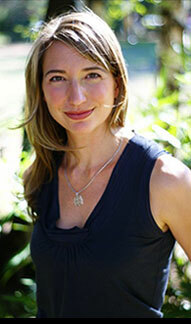 Gritty and heart-stopping, this short story from break-out author Michelle Gagnon also features a teaser to her thrilling debut young-adult novel, Don't Turn Around. Seventeen-year-old Alex might be living day-to-day on whatever he can steal, but he still prefers being on the run to getting caught and thrown back in juvie. Plus, he has Jenny to think of. She comes with her own world of problems, but for once Alex feels like somebody actually needs him. So when a shady organization gives Alex the chance to participate in a medical study, all he hears is easy money—and a lot of it! He'll soon find out there's more involved. 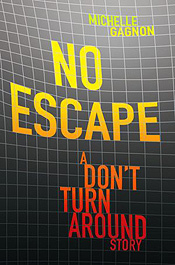 Set directly before Don't Turn Around, which a starred review Kirkus called a "pulse-pounding scary-great read" and "a surefire hit," Michelle Gagnon's "No Escape" lays the groundwork for a world in which every move you make is being watched, and no one can be trusted. When a different kind of justice is neededswift, effective, and personala new type of avenger must take action. 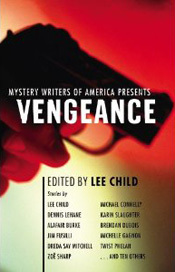 VENGEANCE features new stories by bestselling crime writers including Lee Child, Michael Connelly, Dennis Lehane, and Karin Slaughter, as well as some of today's brightest rising talents. The heroes in these stories include a cop who's seen too much, a woman who has been pushed too far, or just an ordinary person doing what the law will not. Some call them vigilantes, others claim they are just another brand of criminal. Edited and with an introduction by Lee Child, these stories reveal the shocking consequences when men and women take the law into their own hands. Full list of authors: Alafair Burke, Lee Child, Michael Connelly, Mike Cooper, Brendan DuBois, Jim Fusilli, Michelle Gagnon, Darrell James, Janice Law, C.E. Lawrence, Dennis Lehane, Steve Liskow, Rick McMahan, Adam Meyer, Dreda Say Mitchell, Michael Niemann, Twist Phelan, Zoe Sharp, Karin Slaughter, Orest Stelmach, Anne Swardson. 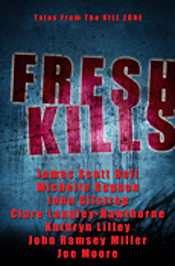 Fresh Kills is a collection of original short stories by the authors of the popular literary blog The Kill Zone. These killer tales vary from the paranormal to the chilling to the just plain scary. In John Gilstrap's suspenseful "In The After," an intruder demands the impossible of Tony Emersonhe wants to set the clock back 18 years and retrieve the childhood that Tony stole from him. John Ramsey Miller's terrifying "Family Again" tells of an orphaned child who gets lost in the woods and, while searching for refuge, knocks on the wrong door. In James Scott Bell's "Laughing Matters," a down-on-his-luck comedian gets a big break, though it comes with a very strange string attached. Michelle Gagnon's thrilling THE CHICKEN GUY reveals how FBI Special Agent Kelly Joneswho was first introduced in her novel The Tunnelssurvives an encounter with a ruthless killer in an abandoned chicken processing plant. Joe Moore's "Final Flight" delivers a gripping tale of a WWII pilot on a secret mission with a mysterious cargo who lets his curiosity get the best of him. In Kathryn Lilley's compelling paranormal story, "Blood Remains," a victim of childhood abuse returns home after many years only to discover that while memories fade, blood remains. In Clare Langley-Hawthorne's evocative story, "The Angel in the Garden," Australian police constable Duff McManus must confront both the death of a childhood friend long considered a traitor, as well as his own wartime memories.